High quality, rugged 8-way terminal block from Bluesea Systems. 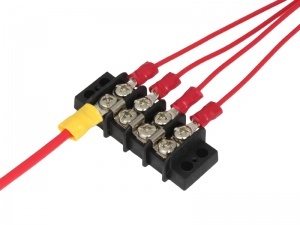 Each screw pair is an individual circuit capable of carrying 20A and the closed back design completely insulates the block from the mounting surface. 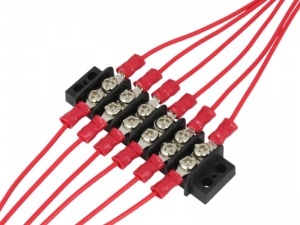 Provides a very tidy and professional looking solution for connecting circuits. Mounting holes: 4 x 4.2mm dia. 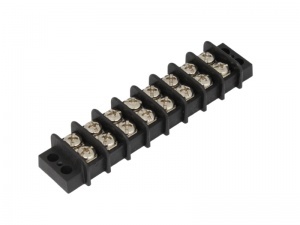 I have used several of these terminal blocks in various sizes and they are good quality. They can be cut down to a smaller number of ways if necessary. Ordering from 12 Volt Planet was no hassle and delivery time was reasonable.